But Republican Party gains among Hispanic registered voters in terms of party identification do not extend to Hispanic voters’ views of the party. Just 10% say the Republican Party has more concern than the Democratic Party for the Hispanic community, unchanged since 2012. Instead, the share of Hispanic registered voters who say there is no difference between the two parties is up, to 35% today from 23% in 2012. The Latino vote has grown in importance in recent years and has played important roles in both of President Obama’s victories. In 2008, Obama won 67% of the Latino vote (Lopez, 2008). That share rose to 71% in 2012 (Lopez and Taylor, 2012). This year, a record 25.2 million Latinos are eligible to vote, though most live in states or congressional districts that do not have close races (Lopez, Krogstad, Patten and Gonzalez-Barrera, 2014). Most Latino registered voters have heard about the president’s decision to delay any executive action on deportation relief for unauthorized immigrants, according to the survey. Two-thirds (68%) say they have heard either a lot (27%) or a little (41%) about it. But three-in-ten say they have heard nothing at all about the president’s decision. Among those who have heard about the president’s decision, the survey shows that about a third (35%) of Latino voters are either disappointed (26%) or angry (9%) about the delay. But about a quarter (26%) say they are pleased (19%) or very happy (7%) about it. When asked who is responsible for the lack of immigration reform this year, Latino registered voters place more blame on Republicans in Congress (45%) than congressional Democrats (14%) or President Obama (20%). By contrast, among all Latinos, just as many blame Republicans (40%) as blame either congressional Democrats (15%) or President Obama (24%). 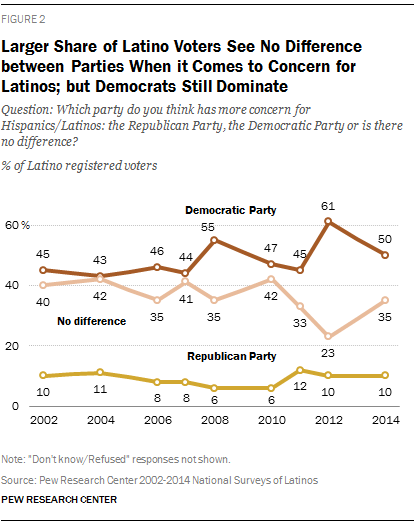 Yet the survey also shows that immigration is not a deal breaker issue for many Latino voters. Some 54% say they would vote for a candidate who disagrees with them on immigration policy if that candidate agrees with them on most other issues. Nonetheless, about one-third (36%) say they would not vote for a candidate if they disagreed with the candidate on immigration policy. Overall, the issue of immigration does not rate as high as some other issues among Hispanic voters. Instead, when asked about five issues that might be discussed in this year’s congressional campaign, more say education (92%), jobs and the economy (91%) and health care (86%) are extremely important or very important to them. By comparison, 73% say the same about immigration. Following immigration, 66% of Hispanics voters say the issue of conflicts in the Middle East is extremely or very important to them. Hispanic registered voters are just as motivated to vote and are paying as close attention to this year’s midterm elections as they were in 2010, according to the survey. About half (53%) of Hispanic registered voters say they are absolutely certain they will vote this year, unchanged from the 51% who said the same in 2010. And today 35% say they have given this year’s election “quite a lot” of thought compared with 32% who said the same in 2010. This report is based on a nationally representative bilingual telephone survey of 1,520 Hispanic adults, including 733 registered voters, conducted from Sept. 11 through Oct. 9, 2014, by the Pew Research Center. The survey was fielded after President Obama’s decision to delay any executive action extending deportation relief to more of the country’s unauthorized immigrants. The margin of sampling error for the full sample is plus or minus 3.2 percentage points at the 95% confidence level; for registered voters, the margin of sampling error is plus or minus 4.8 percentage points. Democrats hold an advantage over Republicans among Hispanic voters in the congressional vote, with majority support among nearly all major demographic subgroups. But that advantage has eroded among most groups since 2010. Half (49%) of Latino registered voters say they would like to see their congressional representative re-elected, while 30% say they would not like to see this. About half (53%) of Hispanic registered voters say they would like to see most members of Congress lose their seats this year while about one-third (36%) say they would like to see most members of Congress re-elected. Some 41% of Latino registered voters say they are satisfied with the way things are going in the country today while 53% are dissatisfied. By comparison, all registered voters are more downbeat about the nation’s direction—just 29% say they are satisfied with the way things are going today, but 65% say they are dissatisfied with the country’s direction (Pew Research Center, 2014e). Half (49%) of Latino registered voters say they approve of the way President Obama is handling his job as president. This compared with 43% among all registered voters nationwide (Pew Research Center, 2014e). More than half (56%) of Hispanic registered voters say the situation of Hispanics in the U.S. today is about the same as it was a year ago, 22% say the situation is better and 20% say the situation of the community is worse. The Democratic Party has a strong advantage among Hispanics on the issue of immigration. Half (50%) of Hispanic registered voters say the Democratic Party is better at dealing with immigration compared with 27% that name the Republican Party. When it comes to dealing with the economy, 44% of Latino registered voters say the Democratic Party is better on the issue while 36% say the Republican Party is better. On foreign policy, 44% of Hispanic registered voters say the Democratic Party is the party better able to make wise decisions while 32% say the Republican Party is the better party. When it comes to dealing with unauthorized immigration in the U.S., 46% of Hispanic registered voters say the priority should be a pathway to citizenship for those who meet certain requirements, 14% say the priority should be border security, and 38% say both should be given equal priority. By 51% to 40%, Latino registered voters say that they think being able to live and work in the U.S. legally without the threat of deportation is more important for unauthorized immigrants than a pathway to citizenship. 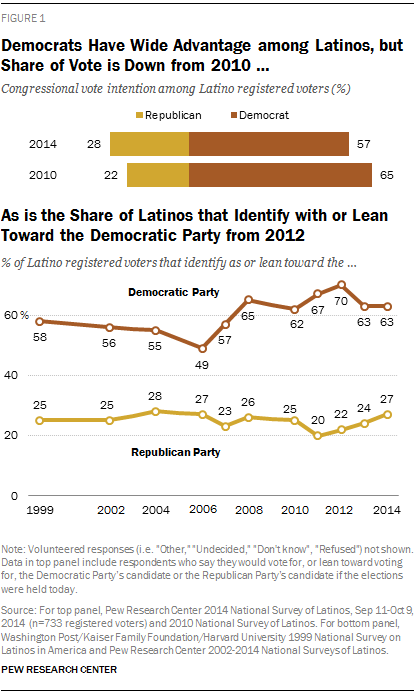 Among all Latinos, that margin is 56% to 35%, unchanged since 2013. One-quarter (24%) of Hispanic registered voters say they know someone who has been deported or detained by the federal government for immigration reasons in the past 12 months. Among all Hispanics, 26% say the same. More than half (55%) of Latino registered voters say they disapprove of the way the Obama administration has handled the issue of deportations. Among all Latinos, 63% say they disapprove. 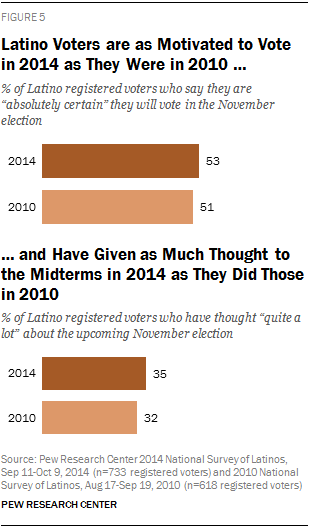 The 2014 National Survey of Latinos (NSL) focuses on Latinos’ views and attitudes about the 2014 midterm elections, immigration reform, and the nation’s direction. The survey was conducted from September 11 through October 9, 2014, in all 50 states and the District of Columbia among a randomly selected, nationally representative sample of 1,520 Latino adults, 733 of whom say they are registered to vote. The survey was conducted in both English and Spanish on cellular as well as landline telephones. The margin of error for the full sample is plus or minus 3.2 percentage points. The margin of error for the registered voter sample is plus or minus 4.8 percentage points. Interviews were conducted for the Pew Research Center’s Hispanic Trends Project by SSRS. This report was written by Mark Hugo Lopez, Ana Gonzalez-Barrera and Jens Manuel Krogstad. Gonzalez-Barrera led development of the survey questionnaire. The authors thank Claudia Deane, Carroll Doherty and Juliana Horowitz for comments on earlier drafts of the report. Anna Brown and Eileen Patten provided research assistance. Brown, Patten, Horowitz and Gretchen Livingston number-checked the report text. Patten number-checked the survey topline. Bruce Drake was the copy editor.